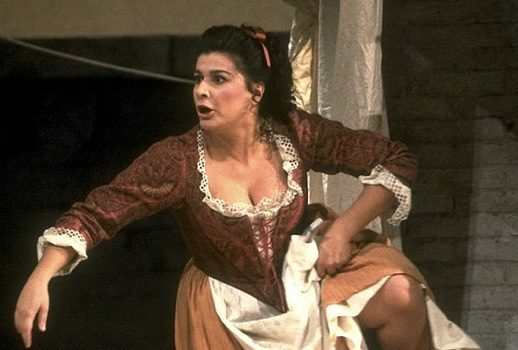 On this day in 1996 mezzo-soprano Cecilia Bartoli made her Metropolitan Opera stage debut as Despina. The subtitle to this evening was “Cecilia Bartoli Meets the Met,” the instantly beloved Italian mezzo making her house debut in the low-flying soprano role of Despina. It is a curious way for a major performer to back into a major house. The role of Despina is not a star turn. It contains the opera’s most conventional music, which is supported for the most part by the thinnest wisps of instrumental accompaniment. Miss Bartoli’s lovely voice and telling diction make their peace with this big house, but I doubt she possesses the power-charged sound to dominate it. Despina, on the other hand, is not the fairest of measuring devices, so let us wait and see. What is clearly transmitted, even from a distance, is the vivid sense of comedy, the telling gesture and accentuation, the deft movement.